I would love to have the chance to recreate the professional Magic that Wella once had and, in certain colors bleaches etc., still has. The retail has been milked or P&G wouldn’t be selling it. Even the early Wella Brand Made sense. 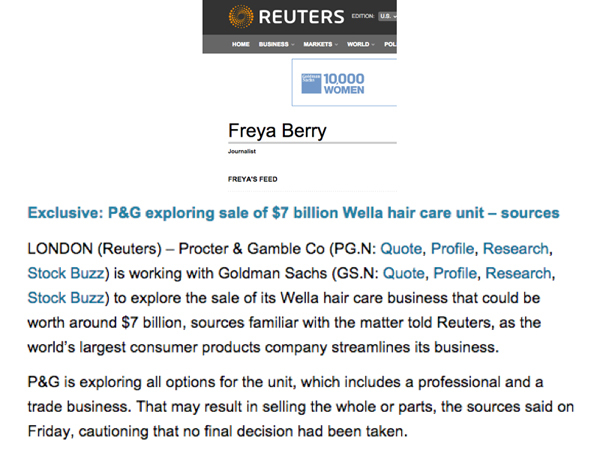 But without the manufacturing and knowing where and what was being done with that and for that and then having to absorb P&G Inventory which we know is not the same as Wella was….. It would have to be at a great enough discount and then close out the existing inventory while we were recreating the line.. I also Understand That VS is for sale so Wella VS sounds liike a great Idea. If Paul Finklestein was still at Regis … for Regis..
WOW Daryll Parmentor Where are you when I need you or Marty Wiegod for that Matter ??????? Love the opportunities if done right.